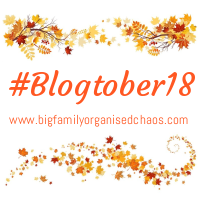 I can’t believe we are two weeks into Blogtober already! Today’s prompt was, “Never Doing That Again”. I have decided to share my reasons for deciding to have no more babies. I’m almost 35 now, and was sterilised at 31. Today I am going to share the reasons why we took the somewhat extreme option of sterilisation. I had my son when I was 27, and my daughter when I was 28. I was on the injection pill before then. However, during my first pregnancy, they discovered I have a clotting disorder, and am prone to blood clots. This means it’s a bad idea to take anything which increases the chances of clots. The Depo injection, implant and most pills were out of the question. I was given the coil after my daughter was born, and had a terrible time with it. My periods were really heavy, and I was in agony for weeks on end. As well as that, it triggered horrific depression. I felt so inadequate when I was essentially useless for a week at a time. My irregular cycle didn’t help, either. I was constantly worried I would end up pregnant again, which only made matters worse. When Did I Decide To Get Sterilised? I initially asked to be sterilised when I was 29, but my GP said I had to be 30 before they were allowed to refer me. Between then and my turning 30, my son was diagnosed with, “Low functioning Autism”. This meant I was even more convinced there would be no more babies from me. Life was so stressful and challenging, it seemed irresponsible to even consider adding more children. The financial impact was also a massive one. I was unable to return to work as I had planned to due to our son’s special needs, so we couldn’t afford a 3rd baby, even if we did want one. My husband is terrified of hospitals, so I knew it was going to be all on me. There was no way he’d get the snip instead. At 30, I basically cried to my GP and said there was no way I could mentally handle another child or pregnancy, so I was 100% sure there would be no more babies for me. I was referred to the Gynae team at the local hospital, who I saw for a consultation a couple of weeks later. As soon as I explained my reasoning, the doctor said she could see I had put a lot of thought into it. She said that given the circumstances, she was happy to go ahead with the surgery. (The Doctor said they usually refer women under 35 for counselling beforehand). Six weeks later, I went into hospital as a day patient. The surgery was done via two small incisions – one in my belly button and an inch long incision along my bikini line. I was sore for about 4 days afterwards, but still able to look after the kids. After a week, I was back to normal, and the relief of not having to worry about pregnancy has been amazing. So there you have it… my reasons for no more babies. I do feel guilty in some ways that some women are struggling to conceive, while I am doing the exact opposite. It was 100% the right decision for our family and me, though. I know how it feels to not be able to do things for your family and the depression it causes makes things seem 10 times worse. Daft rule that, isn’t it! My friend had 3 sections and they told her absolutely no more babies. She asked to be sterilised after her 3rd section and they said no as she was 28 – even though they said she wouldn’t be able to carry another baby to term. Red tape craziness!